I’m pretty sure this car is the cousin of the red 250 SL classic Mercedes I featured here and here, but I forgot to make a note of exactly what model this is, so I cannot be specific. It was a sort of non-descript off-white, cream, eggshell color, so after trying various color-processed options, the black and white conversion was an easy decision. 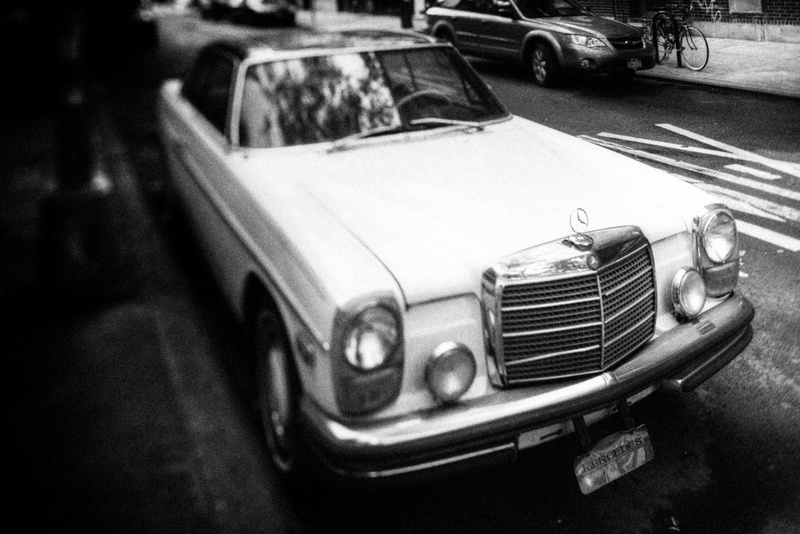 I found this parked in SoHo on Father’s Day, and I’m almost out of my images from that outing. I like the black and white and selective focus Mark! Nice post!i like the car 250 SL classic Mercedes.thanks for sharing. This Mercedes Benz is really cool. Driving with this kind of car would make me feel great. This car is an old model. There are so many new models now of Mercedes Benz but I don’t think that they would beat this kind of model. I like this model to drive. it’s a W114 series 2 coupe, the W113 250SL came out earlier and mechanically ,the 250SL is more like an Aunt than a cousin of the coupe. Thanks, Ron. I’m always happy to be corrected on things of this nature.